As the documentation at this point did not give me – let me say – enough information (e.g. parameters and their meanings) and the examples are “just” for Java (also w/o further describing any details) I experimented a little bit with the “new” procedures within a XS Advanced NodeJS module on a SAP HANA Express Edition installation (based on HANA 2.0 SPS03). In the results DEFINITION column the interface definition can be found. STORE_NAME IN NVARCHAR(530) The store name of the secure store. FOR_XS_APPLICATIONUSER IN BOOLEAN A boolean to indicate if the value is stored for the application user instead of the technical user. KEY IN NVARCHAR(1024) Key within the secure store. VALUE IN VARBINARY(5000) Value of the secure story entry in binary. As we now know some more details about the procedures we are going to use them within a NodeJS module of an XS Advanced Multi-Target application. Please consider that the following coding contains just quick and dirty examples, so code structuring/encapsulation/error handling/… were not in focus. In a real-world application you have to consider that, but of course you know that. To be able to use the secure store an instance of the “hana” (or “managed-hana”) service has to be created with service plan “securestore”. With the new XS Advanced Cockpit this can be done in a very easy way by going to the “hana” service -> Instances -> New Instance. I created one with the name “securestore_test-hana”. This service instance will be bound later to our NodeJS application. Next step is to create a Multi-Target Application within the SAP Web IDE for SAP HANA using the project from template functionality. Within the created MTA a new node module is added (I called it node_securestore_test). To this node module a simple express application will be added with routes to interact with the secure store. The resource “securestore_test-db” pointing to the before created hana securestore service needs to be added to the development descriptor file as resource. This resource is required by the NodeJS module. For the test also an xsuaa service instance “securestore_test-uaa” was created, added as resource and added as required resource for the NodeJS module. Within the server.js file (created by the NodeJS module creation) an express app is created, the hana securestore instance is added as middleware to the express app and an HTTP server is started. To the express app the routes for the secure store tests, defined in the router folder, are added too (details are described in the next chapter). In this step the express routes and the endpoint logic to interact with the secure store is described. First a folder “router” is created. In this folder a file “index.js” is created with the following content which describes the available routes. Within the “server.js” file (see above) that file is used by the “setup of routes” step. As it can be seen in the above router coding the route implementations are created in a new folder “routes” (created within the “router”) folder. Within file “createSecureStoreEntry.js” with the module “@sap/hdbext” the procedure “SYS”.”USER_SECURESTORE_INSERT” is loaded and executed. As store name “TEST_STORE” is used, the used key is “TEST_VALUE” and the value itself is a dummy string converted to a binary. For retrieving the created value in store “TEST_STORE” with key “TEST_VALUE” procedure “SYS”.”USER_SECURESTORE_RETRIEVE” is used. The value store as binary is converted back to a string value for the output. 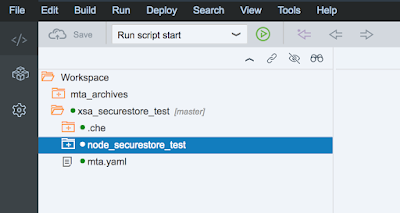 For the deletion of the secure store entry in store “TEST_STORE” with key “TEST_VALUE”, procedure “SYS”.”USER_SECURESTORE_DELETE” is called the same way than the other procedures. After the coding part is finished the MTA can be build and the NodeJS application/module can be executed. In this case the NodeJS application is running on port 51026.